Here’s a new CD from the Daniel Bennett Group from New York, officially released on February 5. The setup of the band already makes clear that this is not another ordinary or traditional jazz band. Guitar, bass and drums together are typically found in pop or rock bands and Daniel Bennett plays alto saxophone and all kinds of other woodwinds like oboe, clarinet and flute (Alto sax with guitar is also a perfect combination since they use a different frequency range and get the necessary space to shine). All songs on the album have been written by Daniel Bennett and his style and his taste are strongly influenced by classical saxophone literature (where he actually holds a master degree), minimalistic composers like Philip Glass and all those “little bits from here and little bits from there” influences you’ll pick up in the capital of jazz music. The songs are quite structured, arranged and do not follow the standard schema of jazz standards. Improvisational parts are included but limited. That also means that a song on the CD lasts between 3 and 4 minutes. The sound of the band is compact and distinct, Daniel Bennett’s alto saxophone sound is beautiful and the quality of the recording is excellent. The first three songs “The Clown Chemist”, “The Spinning Stood Still” and “Paul Platypus” are all played in the default line-up with Nat Janoff on guitar, Eddy Khaimovich on bass and Matthew Feick on drums. 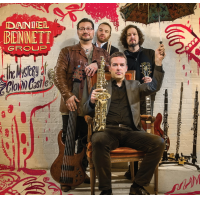 “The Clown Chemist” already shows the ability of the band to play complex rhythm patterns with a shining saxophone flying over the grooving band, changing grooves and instruments, when Daniel Bennett picks up his flute playing like the Pied Piper of Hamelin bringing us all into his musical cosmos. This journey continues with “The Spinning Stood Still” where guitar and bass get a chance to show their virtuosity as soloists. But Daniel is not stopping here, continuing on the path he outlined. He jumps into something different: “Minor Leaguer” is a poem by Britt Melewski set to music with Britt himself reciting his words. A very unique acoustic art work. The next two tunes “Nine Piglets” and “Strange Jim and the Zebra” are again very Daniel Bennett-ish. The title of the songs remind me about funny or mysterious stories from children books and the songs itself have a strong melody played in a very elegant and harmonic way. Britt Melewski gets a second chance to present one of his poems. In “Morning” however the words are more shouted than spoken over a steady riff played by the band. With “Inside the Outside Interlude” and the last song on the CD called “Outside the Inside Outro” we get to know another facet of this CD, the “Free Jazz” side of Daniel Bennett, featuring Jason Yeager on piano. Jason Yeager gets his big moment in “Uncle Muskrat” which is the most down-to-earth title on this CD. This song is rather bluesy and straight played with a soft double bass and smooth percussion background. Very classy. Daniel Bennett takes us on this CD on a journey to rather different shores. Songs like mysterious children stories, poems and free jazz music show the many facets of what Jazz is all about: Express yourself. “The Mystery at Clown Castle” is a true colorful piece of contemporary jazz and I would recommend that you to take some time and listen to the CD more than once to comprehend his music.